I confess – I love food and I’m often guilty of having more than my fair share. I can conquer a buffet like no one’s business but I have to tell you that as I write this post, the prospect of going downstairs to meet my tour group for breakfast is making me ill. I don’t think I can eat anything, anymore. I’ve just done a few squats to make sure the pants still fit and I’m thinking about ringing my personal trainer (at 3am his morning, of course – not that I’m vengeful or anything) and begging for forgiveness and some mercy for when I return home. Real – I’ll be the first to admit that I know next to nothing about Macedonia, or its capital Skopje for that matter, but that’s the primary reason why I signed up for this trip, so that I could learn more about this incredible country. Skopje was actually the birthplace of Mother Teresa and there are plaques and a museum celebrating her life and legacy. Adventure – This first day of the tour is a chance to become more acquainted with the city and discover the famous landmarks on my own, before meeting the tour leader and the rest of the group in the evening. Skopje could be described as a strange amalgamation of socialist Russia and moorish Turkey – hammans and mosques are easy to identify from a distance but there are several stately new government buildings and a multitude of bronze statues also competing for immediate recognition within the city square. Food – At our welcome meeting, Jane (pronounced Yann-eh), gave an overview of our ten-day trip and then took us for a short walk to a restaurant area only a couple hundred metres from our hotel. As soon as we sat down, there was wine on the table and food started to appear in front of us. A delicious mezze consisting of a variety of several different types of cheese, accompanied with dips, grilled vegetables and bread. Thinking that this was dinner, I was full after sampling a little bit of everything on the plate, only to learn that there were another two courses still to come. Okay – it’s a food adventure and things just got real! Real – This morning we met our driver Igor, who appears to hold an honorary doctorate in Tetris, as he somehow manages to load a dozen oversized suitcases into the back of a small minivan. Today’s journey begins at the Stone Bridge, one of Skopje’s most recognisable landmarks, where Jane gives us a brief overview of the city as we make our way towards the entrance of the Old Bazaar. Food – Our breakfast today comes courtesy of a tasting trail around the Old Bazaar, starting with borek and yoghurt at a small cafe. After trying a few types with different fillings, Jane also bought a few pastry cakes filled with chocolate or jam to try. Naturally, the next stop is to sit in the sun at a Turkish tea house and enjoy a few different drinks before moving onto the Bit-Pazar to shop for a few items for lunch. Food – The Bit-Pazar is one of the biggest green markets in Skopje, located at the north entrance of the Old Bazaar. This is where Macedonian cuisine comes to life with fresh peppers and tomatoes as far as the eye can see, marinated olives of every variety, mountains of black tea and spices bought and weighed on scales, large mounds of white cheese of every consistency and much, much more. We had the opportunity to sample a few different types of the all-important cheese before buying our favourites for lunch. Food – Located in the heart of the market are two brothers who have recently returned from Germany and have opened a small kiosk, making delicious wraps which we ate in total silence because it was just that good. Making our way back to the bus, we stopped at a local kebap shop to use the facilities. While we were waiting for the amenities, the owner kindly brought a plate of hot kebaps out to us to eat, straight off the grill. Adventure – The Matka Canyon is rated as the top attraction to see or visit in Skopje. The Matka Lake is one of the oldest artificial lakes in Macedonia and is popular for fishing, swimming, cave diving and kayaking. Today’s adventure is a leisurely boat cruise on the lake with its stunning blue-green water, including a visit to the the Suva section of the Vrelo Cave, noted for its unusual stalactite and stalagmite formations. Food – The best thing about being on a food adventure is that meals are not always served in a formal setting. Jane and Igor had arranged a magnificent barbeque picnic lunch for us at a secluded spot on the lake and all we had to do was kick back and enjoy a glass of wine or two while lunch was being prepared. These guys definitely know how to cater for a crowd – there were fresh salads made, grilled chicken and sausages, and they even brought along the hand wipes and seat cushions for added comfort. Lunch was a lot of fun in a lovely setting and it was so enjoyable that we didn’t realise that the boats had forgotten to pick us up again until much later in the afternoon, naturally when all the wine and beer had run out. Real – En route to our next next destination, we stopped in the town of Tetovo to see the painted mosque Sarena Dzamija. Originally built in 1438 by two sisters, this mosque was later reconstructed in 1833 and has beautiful bright, floral decorative glaze and paintings which were created using more than 30,000 eggs. I can honestly say that this mosque is truly spectacular and definitely worth a look inside. 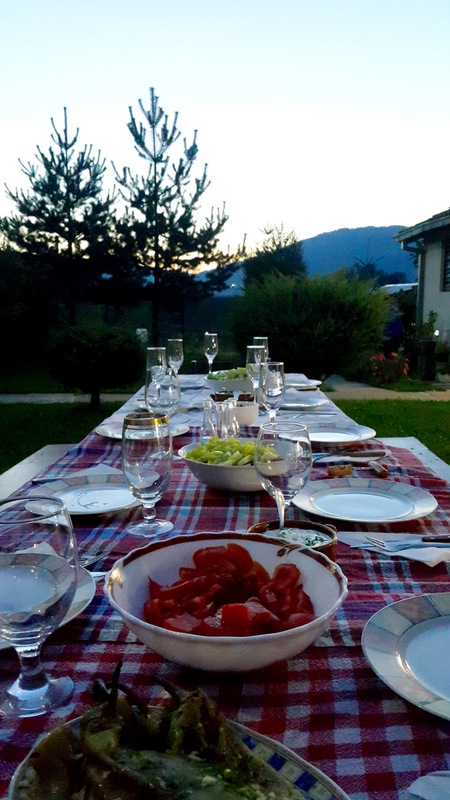 Food – Arriving in the small village of Leunovo in the early evening, our food and most of our home-stay accommodation is provided to us courtesy of residents, Danny and Tina. It’s hard to believe that we need to eat again, but our hosts have kindly prepared a magnificent meal for us to enjoy outside, underneath the stars. Food – This morning we’re back outside at Danny and Tina’s enjoying mekici or Macedonian fried doughnuts, with jam, cheese and coffee for breakfast. The doughnuts are heavenly but there is so much food on this trip that it is almost a struggle just to eat one! 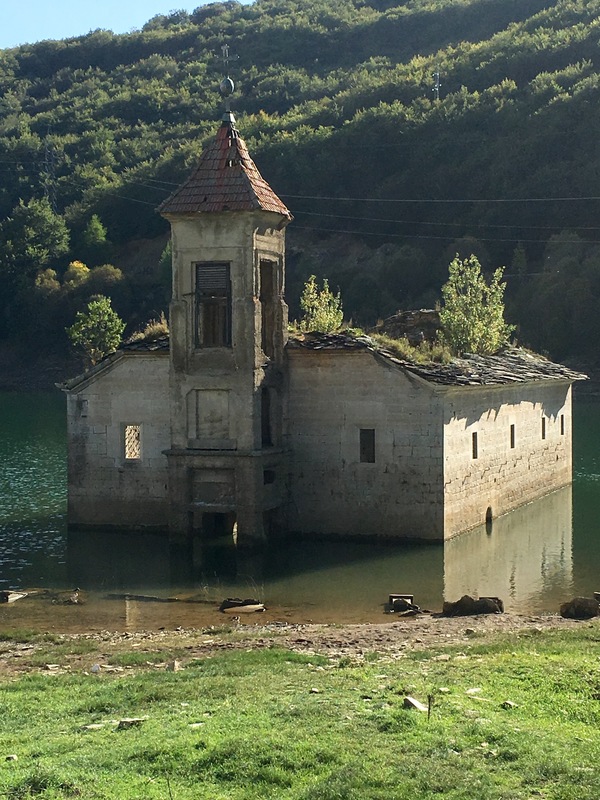 Adventure – Not long after leaving Leunovo, we see the stunning view of St Nikolas church, which now lies abandoned near the shores of Mavrovo Lake. The pressure is on to get that perfect shot for our screen savers, blogs, Instagram shots, Facebook posts and Twitter feeds! Real – The monastery of Saint Jovan Bigorski (St. John the Baptist) is an Orthodox monastery originally established in 1020, although a fire destroyed some of the complex in 2009. The monastery has a collection of a number of holy relics which a many pilgrims come to see, however the wooden hand-carved iconostasis at the front of the chapel is also a stunning and magnificent work of art. Adventure/Food – After our monastery visit, we get to stretch our legs again and walk a few kilometres uphill to visit Duf waterfall (yes, it’s pronounced “doof”). Following the marked trail, it was great just to walk in the cooler mountain air and take pictures of the verdant greenery and listen to the sound of running water. Jane had mentioned that there was a “coffee shop” at the end of the trail which kept us all moving. The waterfall is located within a national park and not otherwise accessible except on foot. Somehow our clever-thinking tour leader had organised a friend to meet us at the waterfall where there was a thermos of tea made from thyme and camphor, hot coffee and delicious homemade baklava (made with cow’s fat, no less) waiting for us. So having finally burnt off the breakfast calories, I ended up consuming nearly a thousand more! Food – With a bit of exercise under our belt, it’s time for some lunch. Nearby in the village of Jance is Hotel Tutto which is owned and operated by Tefik “Tutto” Tefikovski, a pioneer of the slow food movement in Macedonia. After living and working in Europe, Tutto returned to his home town to build his own hotel and restaurant, keen to promote the culinary traditions and produce of the Radika Valley region. The valley is home to approximately 40,000 sheep and renown for the variety of mushrooms that grow there in season. One of the first dishes that Tutto introduces to us is ajvar (pronounced “ivar”), a delicious paste made from roasted red peppers, often served as a side dish or spread and is very popular in Macedonia. It usually takes five kilograms of red peppers to make just one jar of ajvar. The process is quite lengthy and time-consuming, taking several hours of roasting just to produce a small quantity. In jest we asked Tutto whether there was a Thermomix version available and duly received a blank look in reply. Food – I’m not a fan of mushrooms and while Tutto was displaying them to us and preparing the next course, I was wondering how I could politely refuse as I was sitting right up the front. The mushroom stalks had such a meaty texture that curiosity got the better of me and I tried one … and it was incredibly delicious. I just got that one taste because the pan returned back empty! Our “lunch” was a veritable feast as Tutto kept cooking a number of dishes to try, including a number of different salads, grilled beef chops and dessert. Halfway through our lunch a German camera crew appeared to film Tutto cooking for us … who knows I might be appearing on an Al Jazeera television segment soon! Adventure – Today we have the opportunity to take an optional excursion to visit the St Naum monastery and then enjoy lunch in the small fishing village of Trpejca, following a short boat cruise across Lake Ohrid. Real – The monastery of St Naum was founded in 905 A.D. and gets its name from the medieval saint who founded it. It’s a popular tourist destination for visitors to Macedonia, noted for its architecture, artisan and historical significance. The hand-painted frescoes and dome inside the church are well preserved and quite captivating. Adventure – Thankfully the weather held out for our boat cruise as we followed the lake shore. There were dark, stormy rain clouds above the mountain ranges surrounding the lake that looked ominous but otherwise it was relatively smooth sailing. After 45 minutes we arrived at Trpejca, which has its own secluded beach area, and is becoming an increasingly popular destination for visitors because of its private locale. Food – Lunch had been arranged for us at a family-owned restaurant in Trpejca which specialises in serving fresh trout caught from the lake. The owner’s 86 year-old mother was still in the restaurant keeping a quiet eye on things! It was the perfect Sunday lunch sitting outside, enjoying a glass of wine with a view of the water. Lunch consisted of shopska salad, makalo (garlic spread), cheese, grilled trout and chips followed by pancakes with chocolate sauce. Adventure – Arriving back in Ohrid in the mid-afternoon, Kym, Jann, Greg and I were keen to explore the old town a bit further, and Jane kindly obliged by guiding us up to King Samuel’s fortress where we could see panoramic views of the city and lake below and hear about its military history. We then followed Jane down the opposite side of the hill to capture the stunning view of the Byzantine Church of St. John, situated on the cliff over Kaneo Beach. I kept thinking that I would never have discovered this part of Ohrid if Jane hadn’t decided to accompany us on a private tour of the old town. Food – Walking along the lake shore, we stopped by a restaurant along the waterfront for a glass of Macedonian bijelo vino (white wine) and local bar snacks to relax and watch the setting sun. Food – No less than 30 minutes after arriving back at the hotel, it was time to get back on the bus and travel to the village of Kuratica to enjoy dinner in the mountains. Our host for the evening was Goran and his family, who welcomed us into a purpose-built private dining area with a glass of his famous home-brewed rakija which is made from nettles. With 50 percent alcohol content, it was perfect for a chilly evening in the hills but I wisely limited myself to just the one glass. The regional delicacies served for evening included edible snails foraged from the forest, cheese pie and slow-cooked pork with mushrooms, followed by chocolate cake. Somehow I couldn’t bring myself to try the snails but was more than happy to sample dessert. Food – Breakfast this morning was an assortment of borek and pastries from a bakery located in the local market of Ohrid. Being a sunny Monday morning, the market was thriving with plenty of fresh fruit and vegetables and all manner of produce to purchase, including jars of the much-coveted ajvar. Real – After the market visit, we left Ohrid and drove to the village of Brajcino, passing through the town of Resen, located equidistant between Ohrid and Bitola. 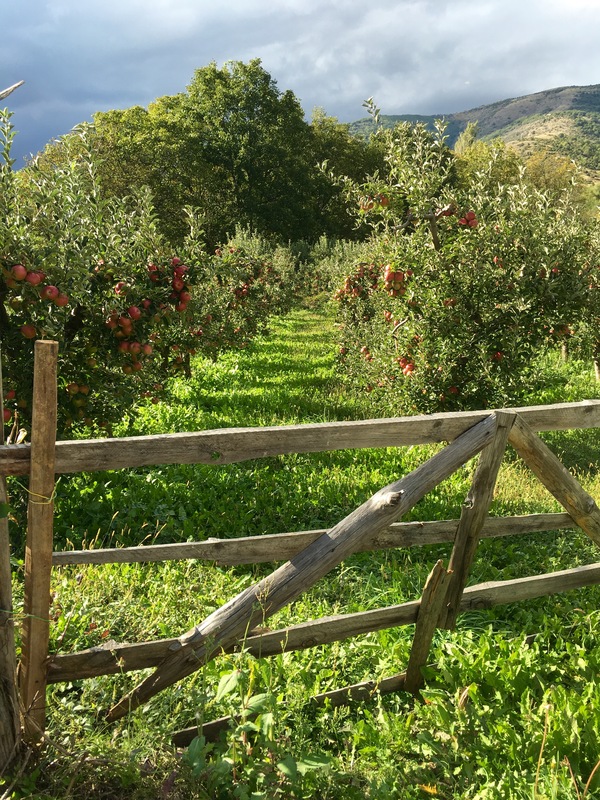 Situated near Lake Prespa, Resen is well known for the quality and unique taste of the apples grown in the numerous orchards planted throughout the area. Food – Later in the morning we arrived in the quaint village of Brajcino, where we are introduced to Milka who lives on a small acreage of land near Lake Prespa, located relatively close to the border of Greece. Carp caught from the lake is considered to be the regional speciality and Milka demonstrated a recipe that she typically prepares for our fish lunch. With the carp in the oven, we kicked back with bijelo vino, helped prepare a salad with a few items bought at the market in Ohrid and had another opportunity to practice rolling the perfect dough to make a pie. Adventure/Food – This morning we met Jane early in the hotel lobby in search of the local breakfast specialty of tripe soup. Not that I was particularly keen to partake but I did want to see what it looked like. Despite wandering through the city square and enquiring at a few cafés, the supposed local specialty didn’t appear to be on the regular breakfast menu. Jane did however find a restaurant that had fantastic homemade soups for breakfast but unfortunately the waiter on duty was more than a little slow on the service aspect which meant that timing for the morning activity had to be changed to accomodate our meals. Real – After breakfast we met the rest of our group for an orientation tour of Bitola, a city of 75,000 people, it is the second largest in Macedonia, located only 14 kilometres away from the border crossing with Greece and surrounded by a number of prominent mountain ranges. Previously known as “Manastir”, Bitola was part of the Ottoman Empire from 1382 to 1912 where Turks were the majority in the city. Mustafa Kemal Ataturk was once stationed in Bitola for a period of time. Bitola has a long history of being a strong trading centre and many cultural organisations and consulates are still located there today. A world-class film festival celebrating the work of cinematographers is held in the city centre every year, bringing celebrities from all around the globe. 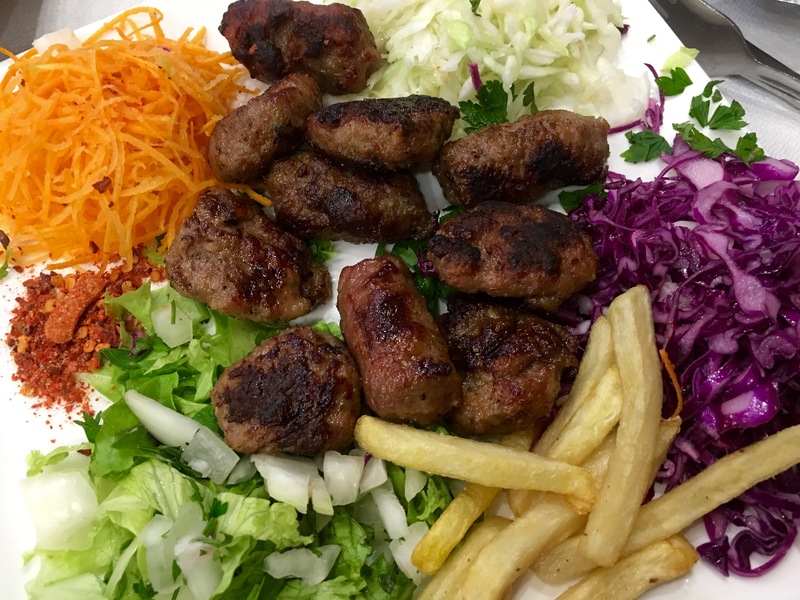 Food – Our walking tour of Bitola brings us into the Old Bazaar where the buying and selling of goods continues to be in the lifeblood of the city. It was fascinating to see an old Turkish hamman at one of the entrances to the market now surreptitiously transformed into a supermarket. Everything is for sale in the Old Bazaar – even plastic soft drink bottles filled with pigs fat! Real – Near the outskirts of Bitola are the remains of the ancient Greek city of Heraklea Lyncestis, later occupied by the Roman Empire. I’ve personally seen the handiwork of a few Macedonian concreters throughout my lifetime and the restoration efforts applied at Heraklea appear to have utilised the same modern day techniques. While there are a few tonnes of concrete poured throughout the ruins, particularly the amphitheater, the tiled mosaics are quite spectacular. Food – Located on the opposite side of Bitola, in the foothills of Mount Pelister, we drive to the small village of Dihovo for our included lunch and visit to a local beekeeper for a masterclass. Our host at Villa Dihovo was away supervising the current wine vintage when we arrived so we enjoyed a short walk through the village to see the apiary. The first order of business was to put on protective sleeve suit complete with hat and enclosed veil. After that challenge was successfully completed we gathered around one of the hives to learn about how honey is made and extracted, the life and times of the average honey bee followed by an elusive search to locate the Queen bee (the one wearing a spot of blue on her wings). Following our tutorial we got to taste some of the produce and different flavour combinations. My favourite was the creamy, crystallised honey very similar to the one that my late Grandfather used make from his own hives. Food – Arriving back at Villa Dihovo we met our host Pece Cvetkvski, who kindly took a chosen few down to his cellar to learn more about his wine production and local produce. An amazing banquet of homemade sausages, salads, cooked meat and stuffed vine leaves had been laid out when we made it back upstairs, accompanied by Pece’s homemade pinot noir. Real/Adventure – When I first heard at the tour briefing that we would be visiting a couple of wineries hosted by an expert in Macedonian wines, I thought all my Christmases had come at once. Now looking back in hindsight, if I had to describe what this day was like, it can be likened to visiting two sets of relatives on Christmas Day and having back-to-back feasts served with free-flowing matching wines. Our group left Bitola mid-morning gradually making our way to the Tikves wine region, arriving at the Popova Kula winery just before midday. Here we met Alexandra, our hostess during our visit at Popova Kula and were also formally introduced to Ivana Simjanovska, who is a wine judge, co-author and publisher of the Macedonian Wine Guide. Popova Kula literally means “Pope’s Tower” which once stood as a distinguishing landmark in the Demir Kapija valley where the winery is situated. A 17-metre replica tower now features prominently at the front of the vineyard as well as in their logo design. Following a short tour around the winery and cellar door area, we are ready to start sampling our selected wines. Real – Macedonia is very much a part of the “new world” when it comes to wine, yet the paradox is that wine has been produced in this region for a number of centuries dating back to a period B.C. Ivana gave a fascinating overview of the history of Macedonian wine including a discussion on the nationalisation of all wine production after the Second World War and how Macedonian wines are now in a period of renaissance, with a renewed focus on producing high quality wines rather than large yields. As a result these wines are starting to achieve international recognition and accolades. Food – Stanushina is a unique Macedonian grape variety that Popova Kula specialises in utilising in their own signature wines. Ivana chose a Stanushina Rose 2015 with a striking salmon pink-orange colour and soft aromas of fresh strawberries as the first wine to drink. With a dry, medium finish, the flavour of wild strawberries complemented the Macedonian salad that was matched with the wine. The next wine paired with the salad was a Zilavka 2015 which had a pale green straw colour, herbaceous aromas of cloves, sage and thyme, together with subtle citrus notes on the nose. A clean, dry, medium finish and fresh lemon flavour on the palate. Food – Looking very much like Christmas dinner, the next course served was a delicious dish of pork stuffed with plums matched with a “Perfect Choice” Vranec 2013. Ivana specifically selected the 2013 vintage as there was heavy rainfall recorded during the 2014 vintage. Deep, rich ruby red in colour, Vranec displays blackberry fruit on the nose with hints of vanilla from the American oak barriques used during the maturation process, complemented with aromas of white pepper and tobacco. This wine had a lovely, smooth, soft tannic mouthfeel and plenty of fruit-driven flavour. Real/Adventure – The next winery was located in a different part of the Tikves region, about 20-30 minutes drive away from our first stop. The Stobi winery is a top producer of Macedonian wine despite only being in operation since 2009, making it the youngest winery in the country. Our visit included a tour of the fermentation facility and education about the production process before concluding at the cellar area where the barriques are stored. Food – Jane had casually mentioned during a previous conversation that the food at the Stobi winery was exceptional and that we should really wait to eat at this restaurant. The problem with this plan was that it was now 5PM when we sat down in the restaurant to eat the “second lunch” and this is where the Macedonian hospitality came out in full force, with no less than five dishes put on the dining table before us to eat. Rkaciteli 2015: Rkaciteli is a grape variety that originated in Georgia and was brought to Macedonia 40 years ago. It produces high yields and the resulting wines were principally exported to Russia. This wine is light-bodied but with a balanced structure. There are aromas of lemon citrus, green grass and jasmine subtly complemented with flavours of honey, apricot nectar and citrus on the palate. This wine pairs well with salads, smoked meats and cheeses. Chardonnay 2014: Pale yellow straw in colour but also displays a slight green hue. Ripe tropical fruit aromas predominantly of kiwi fruit married with lemon/lime citrus on the nose and palate. Syrah 2011: My favourite grape variety … now we are talking! This wine had been maturing in French and American oak for a period of 15 months. Lots of spice and pepper savoury notes with hints of vanilla typically associated with the integration of the wine with oak barriques. A combination of black fruit and savoury notes on the palate with a medium, dry finish. Lovely flavour and texture. Aminta 2013: This wine is an amalgamation of equal quantities of Vranec, Merlot and Cabernet Sauvignon, separately maturing in French oak barriques for 18 months before bottling. Beautiful ruby red in colour, the Vranec brings a powerful black fruit structure to the wine, Merlot adds elegance and softness and the Cabernet contributes pepper and savoury characteristics. A nice full bodied wine with 14% alcohol content. A very elegant wine from an excellent vintage. Real – The poor restaurant manager was a little distraught when there was so much food left untouched on the table and wanted to know what was wrong. The meals were absolutely delicious and of the highest quality but the quantities served were more than my ever-expanding stomach could accommodate and I am certainly capable of eating vast amounts of food. So just like Christmas, we rolled back on the bus to Skopje with full bellies, happy vibes and ready for bed. Real – When you sign up for a multi-country tour, long periods of road travel are sometimes inevitable and today’s journey is expected to be an eight-hour marathon bus trip. We say goodbye to Macedonia and make our way to Montenegro, passing through Kosovo and Albania en route. Kosovo has a deep admiration for Tony Blair and Bill Clinton of epic proportions, so much so that numerous children born after the war were named after these two statesmen. In a small regional town, we drove past the newly opened “Bill Clinton Sports Stadium” so it’s absolutely true! Adventure – Our first stop for lunch was in picturesque Prizren (affectionately mispronounced as “Prison”), the second largest city in Kosovo well known for its Ottoman architecture, particularly the Sinan Pasha mosque and Old Stone Bridge. Food – Prizren has a distinct cafe culture with lots of young people enjoying coffee and conversation in the city square. From one of its famed qebaptore (barbecue restaurants) in the Old Bazaar, I ordered the mixed qebap plate for lunch which cost only 3EUR and it was absolutely delicious! Adventure – The best laid plans can go horribly pear-shaped on holidays, even on organised tours. Shortly after crossing over into Albania the tour bus experienced engine failure so we had an unscheduled coffee stop in the town of Kukes to rectify the issue. After getting back on the road again, the problem reoccurred so we found ourselves at a rest stop that looked like Albania’s homage to Las Vegas, complete with a dedicated wedding chapel and replica Universal Studios signage, while waiting for a replacement bus to come from Skopje. There are worse places to be stranded so with a fully stocked bar on hand and obliging waiter, we kicked back with several G&T’s and a marathon game of cards. Real – Three hours later our new vehicle arrived looking more like a mobile disco than a transit bus and we were finally on our way again after spending considerably more time in Albania than originally planned. Just after 10PM and only 60 kilometres from our intended destination, we had another unexpected delay when we encountered a roadside accident and waited another 30 minutes for the police and ambulance to clear the road. After more than 12 hours since leaving the hotel, we finally reached the beautiful Old Town of Kotor in Monentegro close to midnight. I’ve never been so happy to arrive at a hotel in my entire life. Real – I love James Bond movies, especially “Casino Royale” which was supposedly set in Montenegro (and which might have given me more impetus to take this tour!). Montenegro, which means “Black Mountain”, is a small sovereign state with only 700,000 inhabitants and has been touted as one of the top world destinations to visit. The beautiful Old Town of Kotor has historic cathedrals and churches, a myriad of winding alleys and numerous cafes, restaurants and tourists yet no matter how far I walked, I never did manage to get a glimpse of Daniel Craig. Food – The village of Njegusi, located high in the mountain ranges above the town of Kotor (about 900 metres above sea level), is renown for its smoked dried meats and artisan cheeses. Its location made for an interesting trip, given that we had to slowly climb up the dizzy heights of Mount Lovcen, in a small bus on a narrow, winding road. Eager to get some fresh air and stretch the legs, we made a beeline to see the hams drying in the rafters of the smokehouse. In the building next door a small batch of Vranec grapes was currently going through the process of being transformed into wine so we had a look around to see how the vintage was coming together. Platters of smoked ham and beef, cheese, olives and bread were served for our enjoyment together with the customary alcoholic drinks and all the while I was thinking that it’s not even 11AM and here I am drinking shots of rakija and glasses of wine. This tour is starting to wear me out! 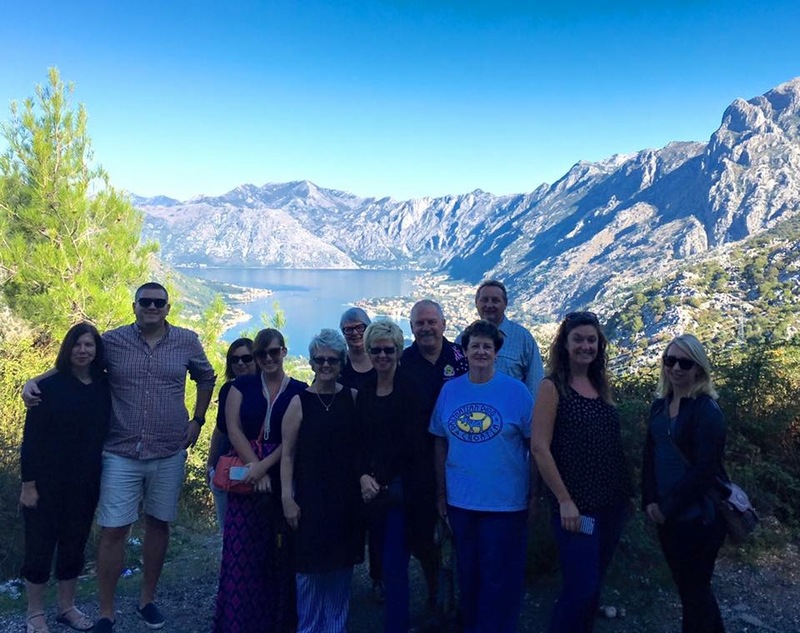 Adventure – Given our very late arrival into Kotor the night before, I decided to skip the olive oil visit and spend some time meandering around the Old Town in the afternoon and do some sightseeing before the next cruise ship arrived into port. It was a lot of fun exploring the labyrinth of alleys and wandering into the cathedral without large crowds obstructing the entrance. Food – There’s lots of places to grab a decent cup of coffee in Kotor but as a popular tourist destination, the price of food and wine (which is now charged in EUR) is astronomical compared to Macedonia and definitely not of the same quality. Our last dinner together was at a restaurant that supposedly specialises in seafood yet the mussels I ordered looked like something John West had rejected a decade ago. Although the fillet of bream was nicely cooked it also came with a hefty price tag. I guess that is to be expected if you hang around the playground of the rich and famous. This trip has had so much to offer in terms of amazing food, generous Macedonian hospitality, great wine, fabulous weather, an excellent and dedicated tour leader and driver, beautiful scenery and fun friends to share it all with. Thanks Jann, Greg, Steve, Chris and Kym for being my Intrepid family for the past three weeks and being part of my Real Food Adventure odyssey through the Balkans. This is where the diet finally starts. You might heard of the song “I lost my heart in San Francisco”? Well my version goes something like “I lost my waistline in Montenegro”. Our tour leader, Jane, keeps telling me that I should be hungry for this tour and that I needed to starve for one month before coming on this trip. I think the opposite is true for me and I’ll need to starve for TWO months afterwards BEFORE I am brave enough to see my personal trainer again. Oh wait … I’m now off to Germany, the land of roasted pork knuckle, wurst, potatoes, sauerkraut, pretzels and Riesling … Okay, I guess the diet will have to wait a few weeks more … Bon appetit! This is so amazing! And what a fantastic way to break out of your culinary comfort zones! Love reading your posts!